Ross Morton (real name Nik Morton) presents the reader with a fascinating character in Corbin Molina, not least because his mixed blood cause him problems, but due to him having a hook in place of a hand, and the fact that his reasons for coming to Walkerville are not immediately explained. 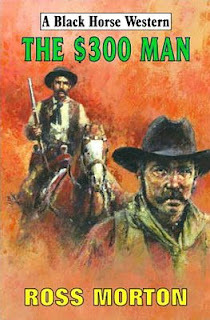 These aren’t the only plotlines that grab the readers attention, there’s also the other well drawn characters, many of whom may not be who they say they are, such as Tillman who seems to have been hired as a replacement lawman by the Walkers, but is perhaps working to his own agenda, whatever that maybe. A fair part of story is told in flashbacks, such as how Molina lost his hand. This is explained in one of the highlight sequences of the tale, that of the battle for Fort Fisher in 1864. Ross Morton also includes plenty of action and a number of twists and turns before everything is resolved satisfactory. The £300 Man is officially released today. I'm glad to hear it's terrific but then again I knew it would be because Nik is such a fine writer. And I've been fortunate enough to publish one at BEAT to a PULP. Paul, I don't know how soon your travel plans are, but remember the Book Depository in Gloucester offers free delivery worldwide on all purchases. I've dealt with them myself and the delivery is very prompt, even when you live as far away as New Zealand. And no, I'm not being paid to say any of this! Many thanks, Steve, for this unexpected review. Much appreciated. And thanks, David for the kind words! I endorse Keith's comments on the book depository, too - real value for money, post free and usually reduced cover price. I've ordered this one myself. This is a good book. Read it. Many thanks for that endorsement, Ray.